The Pivot3 storage-centric approach for virtual desktop infrastructure, characterized by high-capacity needs and I/O-intensive workloads, delivers high performance, lower cost and higher availability than traditional alternatives. Our VDI solutions are powered by the shared storage and compute system vSTAC OS to enable radical end user simplicity so you can focus on only the number of desktops you deploy. With incremental scalability from proof-of-concept to production, customers can count on a predictable ROI and significantly reduce the need for large upfront IT infrastructure investments. Pivot3 vSTAC systems deploy and dynamically scale in minutes for significant savings on cost per desktop. Rapid Deployments – User centric plug-and-play VDI deployments in under an hour with linear scalability from 100s to 1,000s of desktops for easy expansion. High Availability and Greater Fault Tolerance – Minimize risk with 99.9999% availability and no single point of failure for storage, server, or network resources. Do More with Less – Spend less and get more than 2X the virtual desktops per node than replication-based HCI options, as well as high-speed SSD storage and automatic load-balancing. 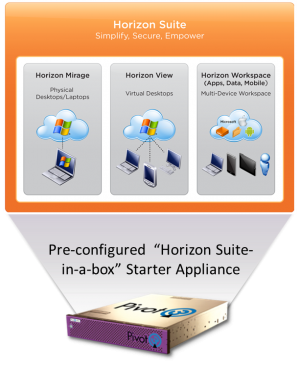 Pre-Packaged & Purpose-Built – Fast and easy "Horizon-in-a-box" experience, with no need to pay for unnecessary hardware. Systems restart automatically in the case of appliance failures, with failover and migration of virtual desktops managed through VMware vCenter. Shared storage and compute resources across the array create highly available storage volumes that exist on all drives, with up to five drive fault tolerance without compromising existing data stores. Resources are automatically load-balanced across all nodes so performance is effortlessly delivered to desktops that are exerting the highest demand. Start with a single node with 2.1TB of usable storage capacity and scale up to 1.4PB of usable capacity at 94% efficiency within a single Virtual Performance Group, aggregating usable capacity, efficiency and performance as you scale. As nodes are added to an existing array, new storage, network, and compute resources are dynamically added to the unified pool, which is ideal for smaller environments that expand over time and for admins responding quickly to changing user requirements in the field. 4X cost reduction for power and cooling compared to systems requiring physical servers and physical SAN or NAS, with low entry costs for enterprise-class vSAN storage performance and failover features. Today's workforce is increasingly mobile and dispersed, leaving IT managers to wrestle with how to support more user devices and maintain security across appliances and data. Enhance the desktop user experience with graphics acceleration options from Pivot3, Teradici and NVIDIA. Deliver a streamlined user experience by maximizing graphics operations and display times. 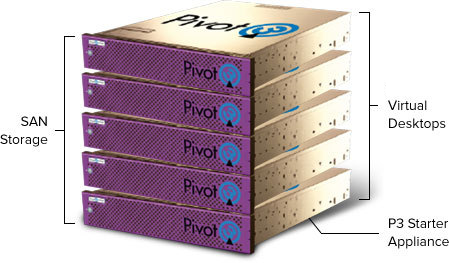 Pivot3 dramatically simplifies your full Horizon Suite production deployment with the only virtualized storage and compute node purpose-built for Horizon Suite that ships from the factory pre-configured and ready to deploy. Pivot3 offers a simple, scalable federal workspace VDI-validated design infrastructure from leading vendors that eliminates the complexity of building out and integrating infrastructure. Today’s workforce is increasingly mobile and dispersed, leaving IT managers to wrestle with how to support more user devices and maintain security across appliances and data. Maintaining a large number of corporate PC’s and desktops with software updates, network changes, and normal wear and tear threatens to overwhelm personnel. Bring your own device (BYOD) is increasingly popular which further complicates IT management. VMware together with Pivot3 deliver a simple, yet affordable, enterprise-class VDI for Mobile Secure Workspace solution that improves end-user access across devices and locations, reduces costs by streamlining desktop management, and enhances security and compliance. Pivot3 centralizes management of storage, server and network resources in a converged vSTAC appliance that is ideally suited for Mobile Secure Workspace infrastructure. Configuration, installation and scaling of the solution are simple and intuitive. Deployments starting at as small as 100 desktops and growing into the thousands will benefit from the Pivot3 vSTAC appliance model since high availability, high performance and load balancing are required for Mobile Secure Desktop installations of any size. Both the R2 and R2S family of appliances can now be field upgraded with certified graphics acceleration options to meet the most demanding graphic needs of top-end Windows 8, Office 13 and power users. These options have been fully tested and certified by Pivot3 and its technology partners. Software based graphics rendering with PCoIP hardware accelerator to enhance VMware Horizon View performance. The Tera option includes a services engagement to install a Teradici APEX 2800 PCoIP Hardware Accelerator and configure desktops to take advantage of the acceleration. VDI Advanced Services (onsite) for this option are required. Typical install times for an array are one day. Minimum time is one day. A factory installed and configured option will be available soon from Pivot3. Hardware GPU virtualization to provide Power User PC-like performance and graphics experience for the maximum number of concurrent users. The K1 option includes a services engagement to install the NVIDIA GRID K1 and Teradici APEX 2800 PCoIP Hardware Accelerator, desktop configuration and tuning for the customers’ application requirements. The customer must procure the NVIDIA K1 and APEX cards independently from Pivot3. Graphic Accelerator cards may be added to either vSTAC VDI R2 or vSTAC R2S appliances at initial customer install or into deployed appliances. Pivot3 vSTAC R2S appliances with Graphics Acceleration options are compatible with the existing R2S and R2 families. 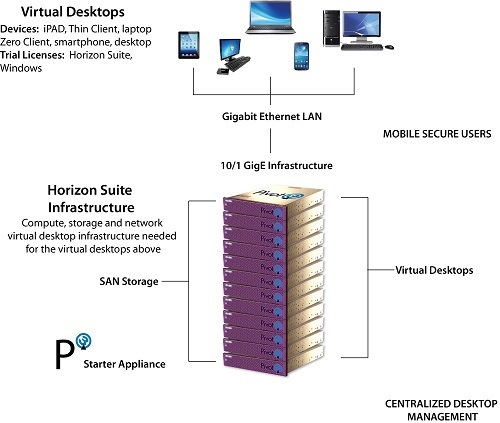 VDI Advanced Services can be provided either remote or onsite. For either a Tera or K1 install we recommend an onsite install. Contact Pivot3 for more information. 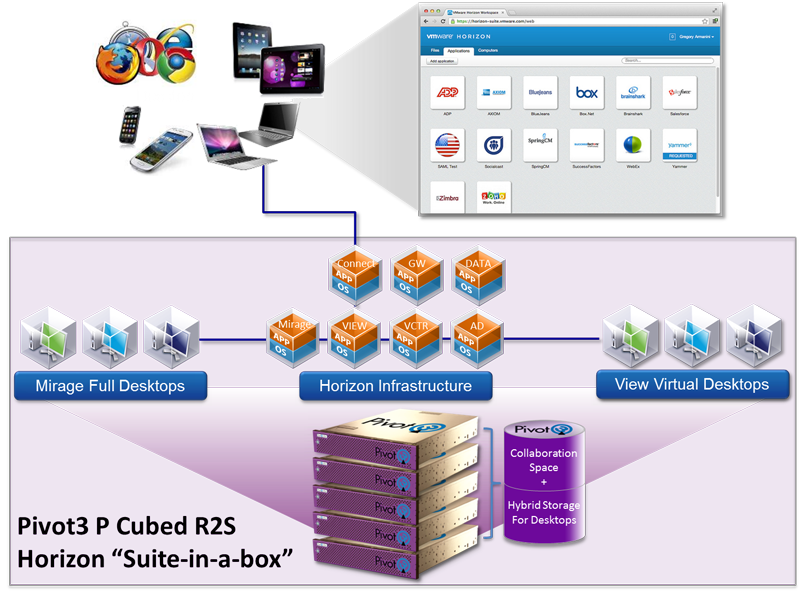 Pivot3 P Cubed is a pilot appliance that is actually the start of your full Horizon Suite production deployment. It is the only converged storage and compute appliance purpose-built for Horizon Suite that ships from the factory pre-configured and ready-to-deploy. Designed to support the demanding nature of Horizon Suite, vSTAC R2S P Cubed has the IOPs you need for desktops and the storage capacity for full desktops, applications and data in one converged appliance. With the Pivot3 vSTAC R2S Rapid Horizon Appliance, you can deploy a fully configured and operational Horizon Suite in 6 hours! Pivot3 offers a simple, scalable federal workspace VDI validated design infrastructure from leading vendors that eliminates the complexities of building out and integrating infrastructure. All storage and server hardware, desktop virtualization software, secure sign-on software and endpoints are validated and tested in a reference design and available in a simple to deploy appliance model. The solution is a certified and validated design (FIPS, CAC, Federal Telework Act). The Federal Secure Workspace Solution for federal agencies is a validated solution architecture specifically built to meet the needs of federal agencies looking to securely support end users across devices and locations.